Vinai Kumar Thummalapally is the former executive director of SelectUSA, what Forbes Magazine calls “America’s chief marketing officer,” from 2013 to 2016. Based in the U.S. Department of Commerce, SelectUSA is a governmentwide initiative to attract and retain business investment in the United States. 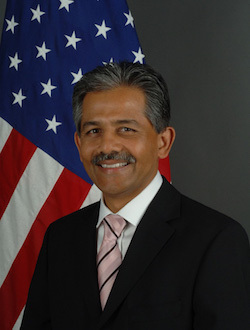 Previously, Thummalapally served as U.S. ambassador to Belize from 2009 to 2013 — the first Indian American U.S. ambassador in history. Prior to joining the foreign service, he had a distinguished 31-year career in the private sector. He was president of MAM-A Inc., the nation’s leading manufacturer and distributor of archival recordable optical discs. During his tenure, the company became the benchmark of the optical disc manufacturing industry. Originally from Hyderabad, India, he moved to the United States in 1974 to pursue his engineering studies. He received a B.S. in mechanical engineering from California State University and completed postgraduate business administration courses at Cal State University and the University of Tennessee.